We have been improving commercial and residential site construction since 1969. 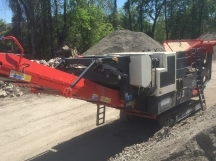 We have recently added a new concrete crusher to our group of recycling equipment. It is a mobile crusher manufactured by Sandvick Equipment Company. The new crusher can process approximately 400 to 500 tons per day and it has the ability to exclude metal encountered with the magnet on the product belt. This leaves nothing but clean concrete base course to be screened by our Metso screen plant. These two pieces of equipment are mobile and require approximately an area 100' x 100' to operate safely in and stockpile SCDOT base course. We also have a bucket scale on our loader that can let our customers know how much material we have processed.